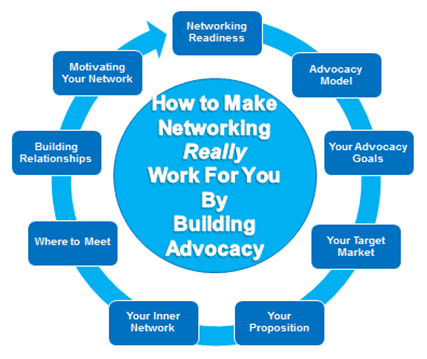 I have been running a series of workshops recently on 'How to Make Networking Really Work For You By Building Advocacy'. At the start of the session I get everyone to complete an honest assessment of where they are starting from. Once you know where you are starting from you can work out the things you need to do to get better results. The most important thing in actually getting more business through networking is then taking action on the things you need to do to get better results. This action plan is what we go on to do in the workshop. For those of you that cannot get to one I am going to cover the different areas in a series of blogs*. The way we get everyone to assess where they are starting from in the workshop is using 10 questions for people to discover their strengths and where they have room for improvement. The questions cover the things that you need to get right to get results as shown in this graphic. You can complete these questions using an interactive pdf by clicking on the picture below. * Part one of this blog series 'Getting More Business Through Networking' will cover the NRG Advocacy System and getting a real financial return. 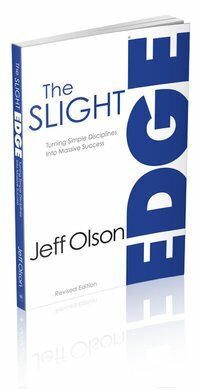 Over the last couple of weeks I have listened to the audio version of Jeff Olson's book, The slight Edge. It demonstrates how to create powerful results from the simple daily activities of your life by aligning them with your 'philosophy' and taking responsibility for what happens. This drives your attitude to taking the right actions to bring results. It's the little things that add up over a long time that make the difference. It is the compounding effect of these actions that make the difference in the long term. These things are important to achieving success and easy to do, but just as easy not to do! You can apply this simple approach to business networking. The people who get great results know why they are networking. They have an inner network that helps them achieve these objectives. The way they do this is by building and maintaining strong business relationships with these people. 1. Set your networking objectives - this will give you the reason to do the little things on a daily basis. 2. Identify your target market and develop your proposition in a way that is easy for people to pass on and understand. 3. With a definite idea of the people you do business with and what you do for them you can identify the people that have influence with them. These are the right people to build relationships with and develop your inner network. Once this is in place it is all about the little things you do on a regular basis to maintain these relationships. This includes the regular meetings, 121s, phone calls, introductions you make, referrals you give and the help and support you offer to your network. These regular small interactions over time are the things that lead people to do the things for you that you have identified as your objectives in the first place. Success in developing business through networking is dependent on building and maintaining a number of relationships. You need to be realistic about the number of these relationships and I have been talking about the effect of the Dunbar Number on this in the current series of NRG Word of Mouth Workshops. According to research from the British Anthropologist Robin Dunbar the number of people with whom one can maintain stable social relationships is about 150. These are relationships in which an individual knows who each person is, and how each person relates to every other person. The Media Coach Alan Stevens wrote recently in an Ecademy Blog that the idea was introduced in a paper published by Professor Dunbar 20 years ago. In this he suggested that the number of people we can maintain 'stable social relationships' with is between 100 and 230 with a mean of 150, the 'Dunbar Number. As evidence for his theory Dunbar looked at the size of ancient villages. Roman legions and academic faculties. The numbers were all roughly the same. 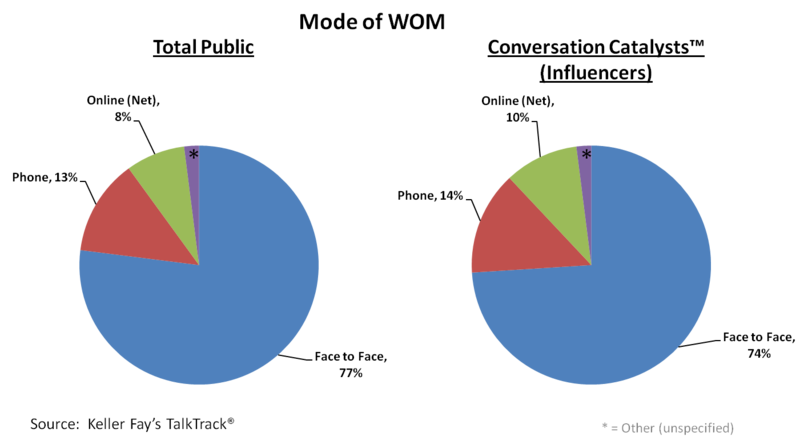 Since the original paper Dunbar has used numerous examples from business and online social networks to support the theory. 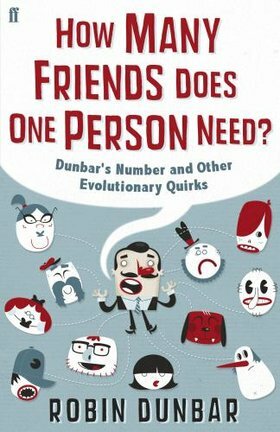 Some people argue that these online social networks disprove the Dunbar number, but in his recent book Grouped Paul Adams refered to research that supports the Dunbar number within Facebook. Amongst the 150 are the number of people we know and maintain social contact with including a small number of strong ties and a larger number of weak ties. These relationships will be spread across a number of real life social networks including our business network. The 150 does not include the number of people we know personally where our social relationship has ceased nor does it include those people we just generally know without any persistent social relationship. Outside of this 150 we form many temporary ties where we interact with people we do not really know. We will go on to form relationships with some of these 'connections' in the future and we lose touch with some of the people we know now. - At least once per year with the other 100 in our 'Dunbar' circles. This demonstrates that we use online social networks in the same way as offline social networks. We use both primarily to strengthen the bonds with our strong ties, and secondarily to build relationships with weak ties. This makes sense for business networking as it is the strong ties in our networks that are most important for positive Word of Mouth and influencing others. I am interested to know if the Dunbar Number works for you? If so, how do you build and maintain your network? Please add your comments here or join the discussion on the Dunbar Number in our Linkedin Group. Do you have enough real conversation? We have been having a good discussion in the NRG Group on Linkedin recently on combining offline and online networking. I find online networks a great way to keep in touch with my real life connections in between the times we meet. They help to strengthen these relationships, to follow up and generally to support my offline networking. Sometimes, though, the online can get in the way of our real life interactions. Have you ever been in a situation where someone is not paying real attention to a conversation, because they are checking their messages at the same time? Sometimes I have to make a concerted effort to stop doing that myself. The article is worth a read and includes this sage advice, "We are tempted to think that our little 'sips' of online connection add up to a big gulp of real conversation. But they don’t. E-mail, Twitter, Facebook, all of these have their places — in politics, commerce, romance and friendship. But no matter how valuable, they do not substitute for conversation." We build our networks of close relationships over time through a series of interactions. It is through our conversations that we really get to know each other and how we can help each other. These conversations are vital to building the depth of relationships that make us effective at building our business through word of mouth. Do You Have The Attention of The Right People? The internet means that most information is available free. 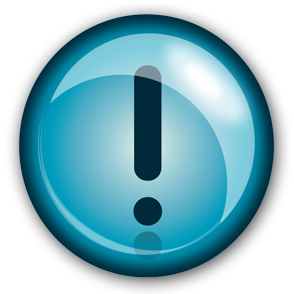 If you are providing information or services at the commodity level then you are competing with this freely available resource. Whatever problem someone has they can find a solution online if they search hard enough. The good news is that very often they still need help and are prepared and motivated to pay. This will often be when they have a problem that needs solving right now and they have neither the time nor resource to apply the solution themselves. At that point they need to find you, but that may be another problem. It is not possible for you to have the attention of all the people who need your help at that critical time. Some more good news is that you do not need to if you are building your business network with the right people. When someone has a problem like that described above they turn to someone they trust for help. That is where you gain their attention if you have built the right business relationships. At the heart of effective business networking is having close relationships with a few key people who each have influence with people who use your type of service. They will often be providing complementary or related services to the types of clients you deal with. If you have people like this in your inner network that clients view as trusted advisors they will get these requests for help. That is when they can recommend you as the person to turn to. You make yourself very attractive within your network if you regularly recommend your close connections in the same way. You can do this by making yourself a person that clients turn to with requests for help. Are you focusing your attention on the right people to ensure you are recommended when they get asked for help by their clients or other business contacts? Advice on successful networking for building business through word of mouth has tended to be anecdotal and based on the opinion of people sharing what works for them. This was one of the reasons for the research we did into efective networking some years ago. We wanted to find the science behind it and that led to us developing the NRG Advocacy Model. The model is all about building your influence within your business network by developing trusted relationships with others who will be motivated to help you. A basic understanding of how people are influenced is useful when applying this advocacy model to your networking. The leading text book on the psychology of persuasion is 'Influence: Science and Practice' by Dr. Robert B. Cialdini. In the book he examines the key ways people are influenced. 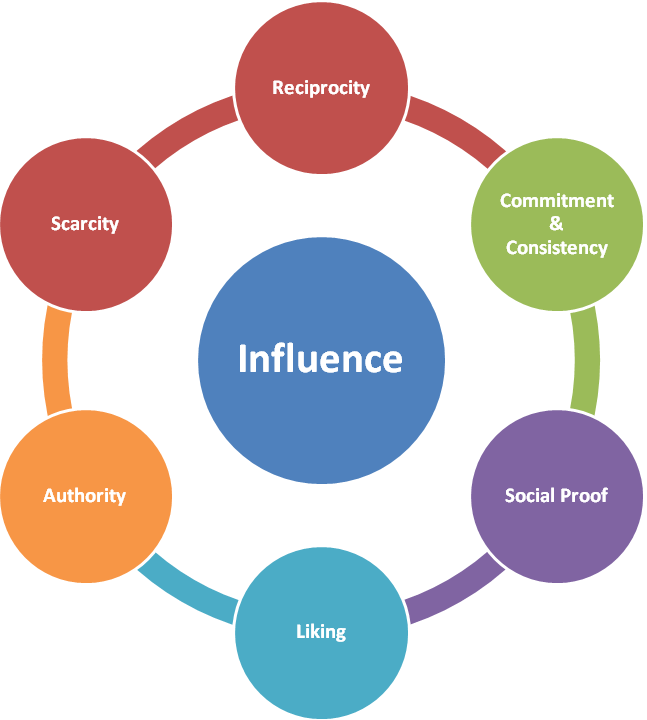 The six are Reciprocity, Commitment & Consistency, Social Proof, Liking, Authority and Scarcity. Many of the activities you need to undertake for building Word of Mouth through networking are under the heading of Reciprocity. Whatever it is that you want from your network then you need to be doing it for others first. The NRG Advocacy Model is all about developing business relationships to the point where you are regularly getting new opportunities, support, relevant information, the right introductions, testimonials and unqualified referrals. For people to be doing that for you means you probably need to take the lead in doing that for them. In the course of doing that you get to demonstrate the other key ways of building your influence. You demonstrate commitment and consistency by regularly doing the stuff you say you will do. You get commitment from others by always being clear about what you want. You provide social proof to others by working this way and by introducing them to other people you do business with. It makes sense to build relationships with people you like as per the old phrase "people do business with people they know, like and trust". By being clear about your your target market and proposition and sharing your stories you build your reputation as THE expert in your niche. When someone comes across a problem that you can solve your authority and scarcity are demonstrated when your contact says, "I will introduce you to ...... They really are the best for this!" Do you have a plan yet for building your influence and route to market through your network? I read a good article recently on the importance of meeting offline from René Siegel. It was featured on Inc.Com and headlined '5 Reasons You Need to Meet in Person'. She highlighted the kinds of things you learn from an in person meeting that you can’t from a virtual or online one. When you meet in person your communication involves much more than the words exchanged. Your eyes and body language reveal much more than words on a screen. The real reason to meet in person is because this is so important in building trust. Most Word of Mouth influence takes place offline and trust is at the heart of this. To be effective in your business networking you need others to be your Word of Mouth Advocates. That involves building relationships with people who trust you enough to refer and recommend you. Trusting others enough to refer and recommend them often comes first. These relationships are built by real life two way interaction. They start with conversations which involve as much listening as talking. They grow by agreeing to do things, following up on these commitments and reviewing things. They continue to grow by agreeing to do more, following up on these commitments and reviewing regularly. Online communication has a part to play, but offline is where you really get to do this and build trust. Are you spending enough time meeting in person with the right people for your business networking to be effective? The recent article from Keller Fay 'Clout in the Real World' reveals how 90% of Word of Mouth Influence takes place offline. The picture above show a nice summary of this (click on the pictire for a larger version). The article explains how influence tools like Klout only measures influence online and do not take account of where most influence really takes place which is offline. The article also refers to academic research on how people communicate differently online and offline. The conclusions in the article give some important lessons if you are keen to grow your business through business networking to generate Word of Mouth. Influence is not driven by people with large numbers of Twitter followers or Facebook friends it is driven by the conversations that people have with their friends. People also communicate differently online and offline. The research reveals that the drivers for online word of mouth are 1. Social, 2. Functional and 3. Emotional. The reverse is true in offline word of mouth where conversations are personal and intimate and the emotional drive is most important. People share emotions like excitement and satisfaction. In order to encourage conversations like that for you then you need to be engaging and sharing stories offline. Online is important, but should not be at the expense of the offline interactions you need to have. 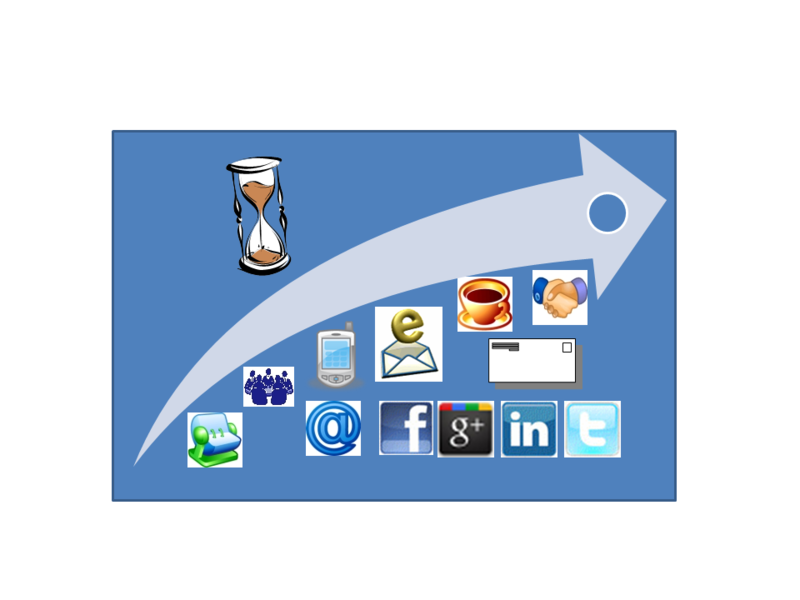 How much time do you spend online and offline and do you have the balance right? There was a good article from Jay Love on inc.com this week on 6 Outstanding 'Unofficial' Business Partners. In the article which is well worth a read he identified six relationships that are worth nurturing if you are using informal contacts to drive your business. Using informal contacts to drive your business is at the heart of business networking and these key partners should not be confined to the people you meet at your regular networking groups. 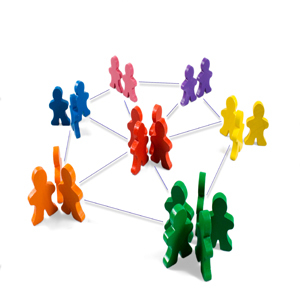 In a good group you will be building and maintaining relationships with complementary businesses with similar target markets to yours and these are the cornerstone of your business network. 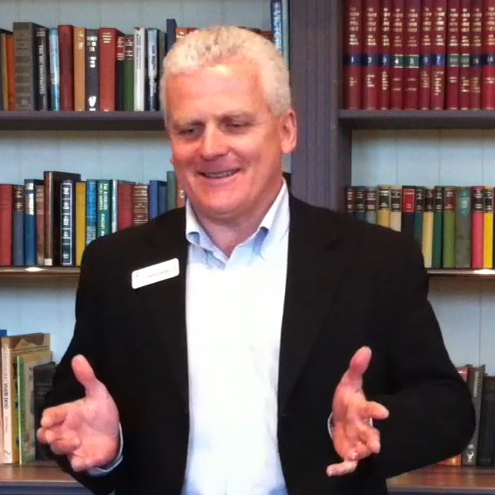 In Jay's article a good 50% of converted business leads came via this group. You will also have other good relationships that could help you to grow your business if you asked. 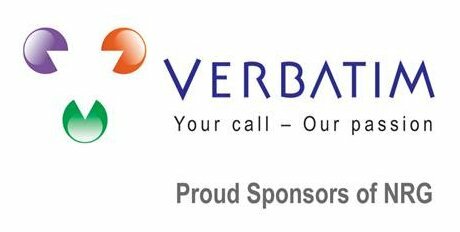 Theses include people you know in industry/trade associations, your professional advisors, key suppliers, customers and old colleagues. Next time you have a conversation with one of these why not explore the additional possibilities with them. You could make a point of speaking with a few of them every week to arrange a catch up. 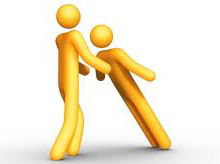 Who are the key informal partners for you in your business and are there people who could be with just a little effort? There has been a good discussion on the best way to follow up with a new networking contact in the NRG Linkedin Group. The discussion was started by this question from Jo Smyth, "What's the best way to follow up with a potentially good, new contact - phone, email, text? And how long do you leave it before you get in touch? I always opt for email but I'd like other's views." There is some great advice amongst the comments so it is well worth a read here if you have a few minutes. The consensus was that there are many ways of communicating, and you should be guided by the preferences of your contact. The other important point that came out is that you should agree at the initial meeting how and when you will be following up. Follow up really is the key to building relationships with others and so is vital to the success of your business networking activity. Those that get the best results are proactive in their follow up with others. They use time at the regular group meetings to agree follow up activities with the people they meet. They invest time in getting to know, like, & trust them. They connect them with the things they need to know and the people they need to know to help them achieve their busines objectives. These are the things that you need to do to motivate others to reciprocate. You only get to know about these by communicating and spending time with them. In this short podcast I explain more on the importance of follow up and share some simple tips on how to get into the habit of following up.